As part of the Museum’s celebrations of the 150th anniversary of the London Underground, London Transport Museum opened its Depot in Acton for an extended Depot Open Week in April. Throughout the week we offered a series of special workshops which gave members of the public the opportunity to see more of the Museum’s transport collections and learn a new skill based on the heritage of the newly restored Carriage No. 353. The workshops were extremely popular and included vehicle photography, a Cab-it day, textile design and creative writing. On the Saturday we opened the doors for our annual Depot Open Weekend with a series of activities designed around the theme of ‘We Love Steam’. Undeterred by the inclement weather, long queues formed out of the Depot and onto Gunnersbury Lane on what was set to become the busiest ever public opening of the Museum the team had ever experienced. Alongside opportunities to stand on the footplate of the recently restored Met Locomotive No. 1 which was in light steam, visitors were encouraged to see for themselves the opulent interior of the newly restored Carriage No. 353 on show in all its gold leaf glory, and wonder what it must have been like to travel First Class on the Victorian Underground. Volunteers from the London Transport Museum Friends, our partnership funders for the project were on hand to reveal the rich history of the oldest known surviving Metropolitan Railway carriage and tell the story of its recently completed restoration. Also in attendance were staff and volunteers of the Ffestiniog Railway, restorers of Carriage No. 353 who had transported the Welsh Highland Railway locomotive Prince from North Wales as part of their own celebrations of the 150th anniversary of narrow gauge railway. Long queues formed all day for the opportunity to stand on the footplate of Met 1, look around Carriage No. 353 and to take part in short rides on Prince. 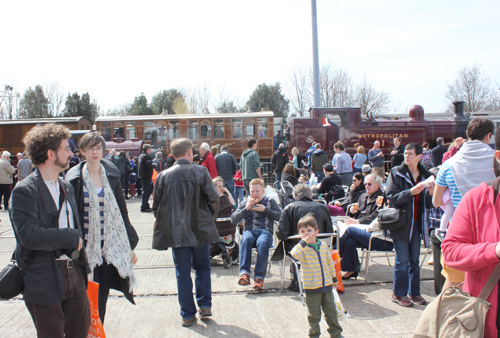 We recorded the highest ever turnout for a Depot Open Weekend and welcomed over 5,800 visitors smashing all previous attendance figures. 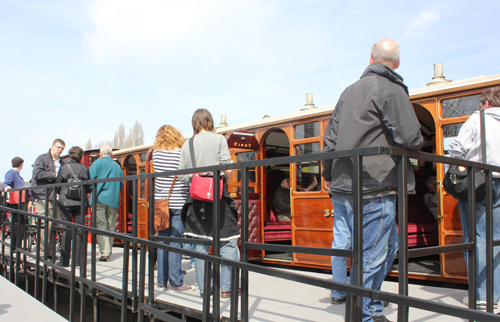 The weekend’s other activities included rides the ever-popular Acton Miniature Railway, collections tours and talks on Carriage No. 353’s history and recent restoration delivered by the Project Curator Tim Shields. The Museum’s restored train also provided the inspiration for our programme of family activities. Younger visitors were given the opportunity to create their own model steam train and decorate a Victorian lady or gentleman who might have travelled on Carriage No. 353 in the 19th Century. On the Sunday, we were delighted to welcome Wesley Kerr, the Chairman of the Heritage Lottery Fund’s London Committee who surveyed the recent restoration of the carriage, boarded the footplate of Met 1 and enjoyed rides on both Prince and the Acton Miniature Railway. The next Depot Open Week takes place in October.